Hello, learners! Greetings from Makerdemy. In this course, you will learn about the MQTT Data transfer protocol with the help of Examples and Projects. The course is a beginner level course on MQTT. The course takes off with the introduction of MQTT and sheds light on the Features that define the purpose of the protocol. 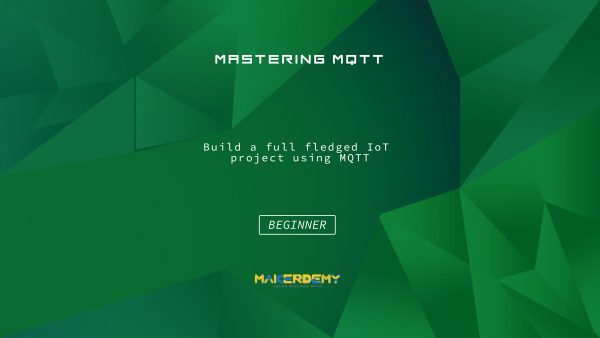 Then the course explains how MQTT benefits the field of Internet of Thing.Next, the course moves on to the MOSQUITTO MQTT BROKER which is one of the standard MQTT broker tool available and teaches how to install and test in on Raspberry pi 3 and Laptop running Windows OS. The course then introduces the MQTT Client tools that help to Publish and Subscribe messages effectively. The course then introduces the ESP8266 which is a low-cost WiFi module that can be programmed using the Arduino IDE. Then the course demonstrates two projects that use MQTT protocol with the ESP8266 12E module. Project 2: In this project, you will learn about the Swachh garbage system where an ultrasonic sensor is used along with ESP8266 and Raspberry Pi to monitor the percentage of the garbage-filled in the bins. The projects are designed to showcase the potential use cases of the MQTT protocol and the ESP8266 module such that you can build your projects. While doing your projects and going through the course, you can feel free to ask your doubts on the Udemy discussion forum. You will get a response within one working day. Thank you and have a nice time learning.